Old drawing based on travellers’ tales. Capoeira is an art that has evolved in Brazil over the last four hundred years, since the first slaves were brought from west Africa to build the new colony for the Portuguese empire. The Africans brought with them a culture of nature-based ritual magic, ancestor worship, and plant-spirit medicine. Their traditional practices changed to adapt to their new environments, incorporating the practices and beliefs of the Portuguese Catholics with their worship of saints, and also those of the indigenous natives who knew the local plants and animals, the weather, and the local spirits. Out of this mix came the Afro-Brazilian religions like Candomble, equivalent in many ways to the Haitian Voudou and other Caribbean spiritualist traditions, and the arts of Capoeira – a strange (to us) ritualized mixture of dance-fight-game. In the mostly African state of Bahia, Capoeira retained much of the ritual magic and ancestor worship of the old African spiritual traditions, while in the urban slums of Rio de Janeiro it became associated with the gangs of the criminal underworld – mostly poor mulatto or mixed-heritage descendants of slaves who flocked to the cities after abolition to try to make a living. So Capoeira, forbidden like all African traditional practices during the slavery days, was forbidden again post-slavery because of its association with criminal gangs. Capoeira is an art rooted in history, the music follows the African and slave traditions of repetitive hypnotic rhythms and call-and-response singing. The lead instrument is the berimbau, a one-stringed harp, one of the most ancient instruments in the world. The songs are about the history of the world and the struggles and joys of daily life. The movements mimic animals and field-work. The martial aspects are all hidden, the art’s history is one of struggle against brutality and oppression, trickery and deception are more valuable in this context than open displays of strength and power. Because of this historical context, several of my (African-Brazilian) teachers would say that “true Capoeira is revolutionary!” In Bahia where it is from the descendants of Africans are still mostly destitute, no money, few jobs, no welfare or health care or education, living in slums in one of the richest countries in the world. African nations are poverty-stricken, their resources plundered by colonialists and corrupt politicians and warlords. The Empires of four hundred years ago remain, along with their legacies of oppression, slavery and genocide. These realities are too easy to forget living in countries like Australia, they are hidden away in the far north and the central desert, in Aboriginal communities and refugee detention centers. Most of us would prefer to think about other things. The greater purpose of Capoeira though is the development of mandinga, “sorcery” or wisdom: understanding of the ways of nature. Human nature, the tendencies for people to take power and abuse it, to dominate or to nurture, to love and to destroy, to fear and rejoice. Understanding the current state of the world through understanding the greater context of history – the corruption of the current world system, and the preservation of the ancient knowledge of where we came from, who we are, our ancestors, and the earth. Being able to read the signs in people’s faces and bodies, their voices and the voices and movements of animals, the weather, the plants, the soil, and live life accordingly. 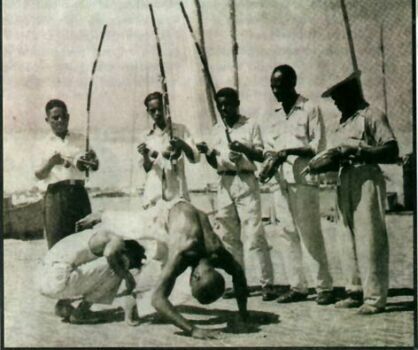 And despite all of this dark history, Capoeira is a game! A truly fun, zany theatrical game, a seemingly carefree and joyous expression of being alive and dancing, playing with friends. Leaping and cartwheeling and bouncing like a cat, a frog…understanding context and history, oppression and suffering does not mean that we should give up hope or define ourselves only by that which we struggle against – it is an art of paradoxes and contrasts, difficult to define, it has to be felt to be understood. Hows everything going these days? Just stumbled on this your website which is pretty cool. Are you doing any classes at the moment? Going to start up a beginners wednesday nights in footscray from next month september – see how it goes. Its at the big west festival space above the dancing dog if your ever about or know anybodies in the area.